TV or not TV? That doesn’t have to be the question, says media expert Nancy Mramor Kajuth in this balanced look at how we can consume media without letting media consume us. We can heed the warnings about overdoing our screen time, says Kajuth, and still use, enjoy and learn from the medium that is so much a part of our lives today. 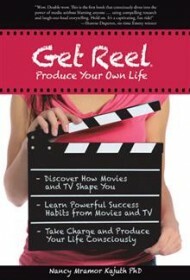 With Get Reel: Produce Your Own Life, Kajuth teaches us how to become more conscious viewers and make healthier viewing choices. Full of television trivia, humor and quotations, Get Reel is part pop culture and part cognitive psychology. Kajuth, author of Spiritual Fitness and Top Ten Tips for Lasting Happiness, knows both subjects from her work as a psychologist and her frequent appearances on television talk shows. While her style sometimes seems glib, such as when she writes, “you need a reality check instead of a reality show,” Kajuth’s chummy tone lets her apply the somewhat dry principles of cognitive behavioral therapy to the real-life habits of media consumers in an entertaining way. In chapters organized by genre – game shows, reality shows, dramas, news, etc. – she explains how we can systematically neutralize the negative impacts of television shows and advertisements by observing and challenging the messages they send. To help us on our way to becoming wise consumers, Kajuth offers quick thought exercises throughout the book, alongside television references galore. Some of these are dated (The Fresh Prince, Ace Ventura), and few target the youngest generation of media consumers (Kanye West may be the most current celebrity mentioned), but others are spot-on hilarious, such as Kajuth’s imaginary interview with NBC Today host Matt Lauer, complete with stage directions for his gestures and facial expressions. Use Kajuth’s own advice to get the most out of her book: Pay attention, decide what to accept or reject and, above all, enjoy the experience.